Do you like going on outdoor adventures? Do you hate using disposable plastic bottles that are bad for the environment and your health? Do you want a convenient flask that was designed for the outdoors loving person? 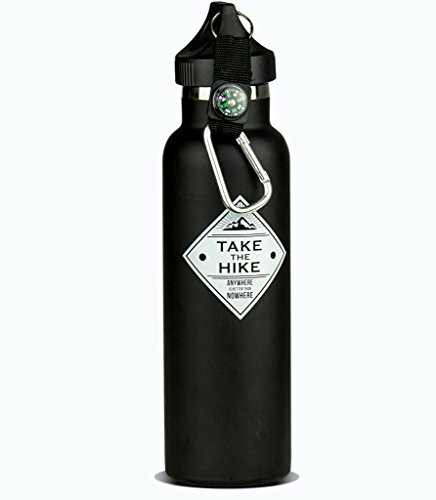 The new Take The Hike water bottle is the best hiking accessory for you. The insulated water bottle is very strong and reliable. The vacuum sealed water bottle will not cause any leaks and it will keep your things dry. The metal water bottle has a standard mouth loop cap for secure locking and easy use. The water bottle is ideal for camping, hiking and backpacking or for any outdoor activity and adventure. The vacuum sealed water bottle is made of the highest quality materials for best performance. The bottle is doubled walled and made of stainless steel for maximum durability. The stainless steel bottle will stay strong for a long time and it is easy to use. The reusable water bottle is eco-friendly and BPA free. The insulated water bottle includes a compass and carabiner clip combo. Now you can stay hydrated and never lose your sense of direction. The stainless steel drinking bottle is the best camping and hiking accessory for you. ESSENTIAL ACCESSORY FOR ALL HIKERS: This premium quality insulated water bottle is the best accessory for anyone that loves the outdoors. Take the heavy duty drinking bottle with you when you go camping, hiking or backpacking. NO MORE LEAKS: Forget about water bottles that leak and destroy everything in your bag. The vacuum sealed hiking bottle is completely leakproof and reliable. The water bottle has a standard mouth loop cap for easy use and secure locking. DURABLE AND SAFE: The camping water bottle is made of the highest quality materials. The bottle is made of stainless steel and it is double walled for maximum durability and strength. The metal water bottle is BPA free and completely safe. ECO-FRIENDLY: The insulated water bottle is very strong and durable and can be used for a long time. The reusable bottle is made of the highest quality materials and it is friendly to the environment. CARABINER CLIP AND COMPASS COMBO: The stainless steel water bottle has a carabiner clip and compass combo for your comfort and convenience. The hiking accessory will keep you hydrated and show you the direction, all in one. If you have any questions about this product by Take the Hike, contact us by completing and submitting the form below. If you are looking for a specif part number, please include it with your message.